I am not a doctor so I can not advise you about Lupus + any vitamin creams. The cause of Lupus is unknown, and since it can be of infectious origin, you should not penetrate skin that has a Lupus rash. Some of the medications you're on may have side effects on the skin as well (thinning the skin). If you have a disease and you are in doubt, always ask your doctor (preferably a Lupus expert). If you have spent time Googling for Lupus + Tretinoin and you could not find anything, then it is unlikely that there is much significant to say about this combination. Are your bumps on the lips themselves or is it in the corners outside of the "raw red lip tissue". I recommend a dermastamp instead of a 1.5 mm dermaroller for such a localized, difficult to maneuver small area. You do not have to insert the needles fully into the skin. The lips and the area around them are extremely sensitive. You may need a numbing cream. It also depends on what kind of trauma occured during your injections. If it caused fat recession, dermarolling cannot fix it. If it is a scar in the skin, there is a chance for improvement with microneedling. Did you have color in your face prior to your laser treatments? If yes, there is a chance dermarolling will re-pigment your skin. The cells that produce the skin pigment melanin reside about 0.3 mm deep in the skin. A 0.5 mm roller (roll twice or three times a week) is the best for lost pigmentation. However, the problem in your case is that if your entire face is depigmented, no melanocytes will migrate from normally pigmented skin into the depigmented patches. Normally, when you roll or needle a depigmented patch of skin and a little outside of its borders, the melanocytes from the surrounding normal skin migrate into the needled/rolled area. Dermarolling can also in some cases "wake up" melanocytes in the skin, respectively make the skin function as it should, including pigment production. Furthermore, when you are lucky, some melanocytes from normally pigmented skin will get stuck to the needles and be introduced to the depigmented areas by rolling. If there is normally pigmented skin somewhere on your face, roll over it when you are rolling your face. If you whole face has no pigment, first try to trigger melanocytes by simply rolling your face. If you get no results in six months, attempt melanocytes transfer from other parts of your body to your face. Select skin that is very well pigmented somewhere on your body, and roll over it several times with a 0.5 mm roller, then immediately roll on your face, then again on the pigmented skin and again on the face etc. One important thing: Melanocytes only produce Melanin upon sun exposure. If you want to re-pigment you face, you must expose it repeatedly to the sun after dermarolling – not immediately after but several days after. You do not have to bake yourself for hours. Nevertheless, some sun exposure is absolutely necessary. Yes, there is a difference between scar-less hypopigmented skin and a white scar. Needling often softens the scar and improves its color (unfortunately not in your case) but currently there is no method that can remove a deep scar. Hypopigmented skin that has no scars is often completely and permanently re-pigmented by needling. Dermarolling / Microneedling / Is such fast progress really possible? If you give us some feedback it would be great, thank you. Any improvement of stretch marks is a victory. 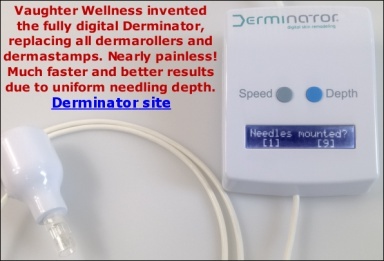 Dermarolling / Microneedling / We sell disinfectant now! Just rinse the Dettol off with tap water and start rolling, no creams added before rolling. 3% peroxide is not an efficient disinfection. Use Dettol on your face. You can use Dettol to disinfect the roller but only if you can find Dettol that does not contain oils. I do not recommend a high percentage Isopropyl because two of our customers wrote us the roller disintegrated after being soaked in 80 % Isoporpyl. We soaked our dermaroller for 48 hours in 45% ethanol and 30% isopropyl without any problems whatsoever. Swan alcohol contains a high percentage of isopropyl and sometimes acetone or other unsuitable ingredients. Yes, washing the hair regularly is enough. It is undoable to disinfect the scalp. You should however clean and disinfect the roller. BTW If you would like to camouflage the balding patches, search the Internet for "hair replication artistry concepts". It is an interesting idea, indeed. It is mainly used by bold men but you could camouflage just balding patches in females as well. If you can afford it, hair transplants of balding patches can also be done. They remove hair bulbs from the back of the head and transplant them to the front. Dermarolling / Microneedling / What can I expect are the differences in the A-Ret Gel 0.05% and the New lower dose Tretinoin? We are going to sell a 0.05% and a 0.1% cream as well but we ran into many difficulties and everything got delayed. Our current 0.025% cream is for sensitive skin. Many people cannot handle Tretinoin creams, as their skin gets red and irritated. Regarding Tretinoin, the more is not always the better but if you your skin has no problem with higher percentages, use them. Dermarolling / Microneedling / Any other recommendations for skin creams / vitamin E? The problem is that I am totally flooded with emails asking about the effectiveness or safety of various creams and ingredients and it is impossible for me to assess the efficacy of cosmetic creams or the safety/properties of hundreds of various ingredients. Yes, you can apply your cream after dermarolling. Phenoxeyethanol is just a preservative preventing the growth of bacteria and fungi. If you make your own creams and do not add any preservatives, you should keep them in the fridge and use it up quite quickly. It should definitely not oxidise that fast, but perhaps there is a rare, special condition why it does in your case, such as a high concentration of a certain metal in your drinking water or your clothes. You could do a test: Put a little of the solution on a plate and observe how long it takes to turn orange. It should take more than a week. If it goes faster, it has something to do with the water or how you diluted it. We think there is a chance that if you have oxygen- or iron-rich water water and you mix that water at a very high temperature with the vit. C, that it may degrade faster. So please try to mix it when it's colder - preferably with water that you have first boiled to expel the dissolved oxygen. Our best guess (my husband has a Chemistry PhD) is that your clothes contain a catalyst to the degradation of vit. C.
Perhaps they contain metal-based dyes that are responsible. One way to avoid the problem is to wait until the vit. C has been partially absorbed into your skin (30 to 60 minutes) and then lightly rinse off the excess, not using too much water so that you won't vigorously expel the vit. C again from the skin. I am very sorry but this forum is to support our products only. If I would have to analyze every company's products I would not have time to answer questions about our own products. It takes sometimes one hour or more of diligent work, searching in medical databases etc. to find out possible side effects of all the substances in the products sold online. Sometimes it may seem that way but I am not a walking medical encyclopedia - many questions have to be meticulously researched before I can answer them. Do you mean prior to dermarolling? You can wipe your skin with Dettol but wash it off before rolling. A 0.5 mm roller should be enough, unless the scar is very deep. If you do not manage to improve the scar at all after 6 months of rolling, buy a 1.5 mm dermastamp and use it on your burn scar. It is not necessary to apply any oils to the scalp. It will make your hair greasy. Yes, 8-10 times is OK.